On 9th August 117 AD (or it might have been the 7th or 8th), the Emperor Trajan died suddenly from a stroke at Selinus in Cilicia on his way from Syria to Rome. This event prompted the renaming of the city as Trajanopolis and the building of a cenotaph to Trajan. Trajan lived 63 years and eleven months. He reigned for nineteen years and six months. As Trajan lay dying, he adopted Hadrian as his heir. According to Dio Cassius, the Empress Pompeia Plotina, a long time supporter of Hadrian, forged the will of her husband and gave the throne to Hadrian. As reported by the Historia Augusta, Trajan’s letter of adoption reached Hadrian in Syria on the fifth day before the Ides of August (9th). Hadrian was in command of the army at Antioch, the metropolis of Syria, of which he was legatus (governor). On the third day before the Ides of August (11th) came another dispatch announcing Trajan’s death. He was now the new Caesar, and that day marked his dies imperii. Hadrian was forty-one years old. 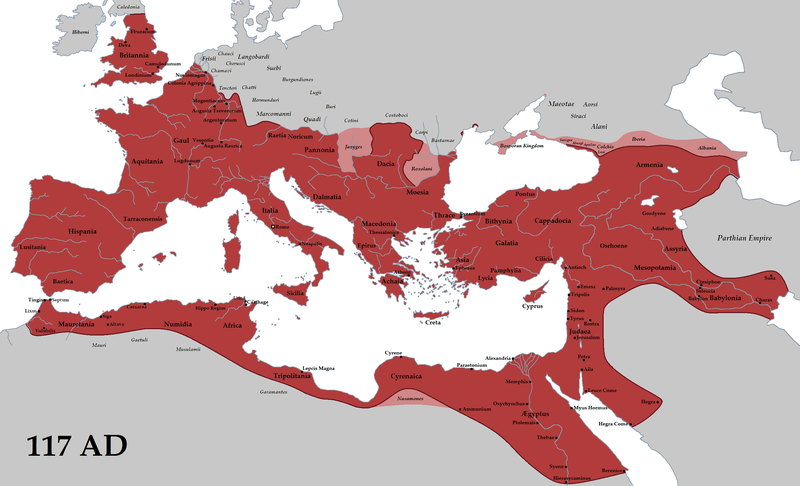 The Roman Empire (red) and its clients (pink) in 117 AD during the reign of emperor Trajan. Hadrian’s first important act was to abandon the conquests of Trajan beyond the Euphrates (Assyria, Mesopotamia and Armenia). Mesopotamia and Assyria were given back to the Parthians, and the Armenians were allowed a king of their own. However, all the other territories conquered by Trajan were retained. Later, in September 117, coins were issued at Rome showing Trajan’s adoption of Hadrian as his heir. The denarius and aureus below have Hadrian as emperor on the obverse. On the reverse, Hadrian and Trajan stand facing one another, holding a globe between them. The first coinage issue makes a point of recording Trajan’s adoption of Hadrian as his successor. Gold coin. 117 AD. (obverse) Bust of Hadrian, laureate, draped and cuirassed, right. (reverse) Trajan and Hadrian standing right and left, holding globe between them. However Hadrian did not go immediately to Rome. After receiving the news of Trajan’s death, he set out from Antioch to view the remains of Trajan. Trajan’s ashes were sent on to Rome by ship whilst Hadrian returned to Antioch, where he remained until October. He then journeyed north-westwards to sort out the Danube frontier. According to ancient writers, Trajan’s ashes (and later those of his wife Plotina) were deposited in a golden urn inside of the base of his column. Hadrian finally left for Rome in June 118 and entered the city on 9 July 118, eleven months after his succession to Trajan (see previous post). Which would be considered the best emperor based on the little we know ? Do we know of any serious contenders for the throne ?